Piety, you know, is a blanket term for acts of devotion toward God. In our lesson, Jesus talks about three different acts of piety: almsgiving (that’s providing monetary and material aid to the poor); praying; and fasting. Good Jews were to do these things in Jesus’ day. They are to do them still today. As unpopular or as disdained as the word may be, followers of Jesus Christ, you and I are called to strive living pious lives. We're to engage in disciplined devotion to God. That means, among other things, giving to the poor, praying, and fasting. It also means worshiping regularly, sharing our faith in Jesus with others, serving our neighbors, and studying God’s Word. Disciplines like these need to become habits for us. But, Jesus tells us, we need to watch out for our motives in adopting them. You all are good enough Lutherans to know that no one’s motives are entirely clean and faultless. Christians are, simultaneously, saints and sinners, forgiven sinners who trust in Jesus alone for our salvation. This side of eternity, none of us engage in any otherwise commendable act of piety with absolutely pure motives. But Jesus warns us tonight not to be hypocrites in doing these pious things. The word hypocrite that Jesus uses is the English version of a Greek word: ὑποκριτής (hupokrites). Hupokrites in ancient times was the term for an actor. In ancient Greek and Roman theater, actors wore masks. The word, hypocrite came to be used for people who strive to look one way to the world, but are really very different under their masks. 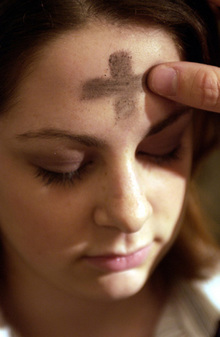 Our acts of piety—including receiving the imposition of ashes on our foreheads on Ash Wednesday—are worthless if they’re just masks we wear. If we come forward for the ashes, yet don’t really believe that we’re finite mortals who need God or sinners who need forgiveness, who are we fooling? Other people? Ourselves? God? Psalm 51, which we read together earlier, has been attributed to King David. He wrote it, the Old Testament tells us, after the prophet Nathan confronted David for two sins which David had unrepentantly committed. David thought he’d successfully escaped responsibility for these sins: adultery with another man’s wife and the arranged murder his lover’s husband. The mask of piety that David wore either fooled the people of Israel or they were so impressed or intimidated by David’s power that they said nothing. But God prompted Nathan to call his king to repentance. David, the most powerful person in Israel, could have simply arranged for Nathan to die. It wouldn’t have been the first time or the last that a ruler covered up his sins with another one. But, as the psalm shows us, David repented. He confessed his sins. He turned away from them, disavowing them. He asked God to create a new heart within him and to align his life with God’s Spirit. David knew that when the focus of our piety is on God and not on ourselves or the esteem of others, the walls between God and us, between us and joyful living tumble down. In our Gospel lesson, Jesus says that those who practice authenticity rather than hypocrisy in their devotion to God receive one reward, while the hypocrites get another. Jesus isn’t saying that we earn eternity. He is saying that we should aim higher than we are prone to do. The fact is that, spiritually, we always get what we aim for. The esteem of others and a comfortable life derived from pleasing the world can come to those for whom those things are important. But on the day you and I see Jesus face to face, these things will be of no value. Better to make our aim to connect with and surrender to God! Then, we’ll not only enter eternity with Christ, Christ will also enter our lives today. Authentic connection with the God we know in Jesus pays the greatest rewards, now and in eternity. Last Sunday, I read Saint Valentine by Robert Sabuda, to the kids during the Children's Sermon. I recommend it highly. Valentine was martyred in the third century on February 14. That was one day before a traditional Roman holiday, Lupercalia, devoted to the remembrance of the she-wolf who, in ancient myth, suckled Romulus and Remus, the founders of Rome. Saint Valentine was a real person though, and Christians' decision to celebrate his martyrdom around the same time as an already-established pagan holiday represents the ongoing genius of the Judeo-Christian faith for reclaiming and rebaptizing celebrations to honor the God revealed to ancient Israel and ultimately, in Jesus of Nazareth. In Old Testament times, the ancient Israelites reclaimed the sites of altars to the numerous gods worshiped by others and devoted them to the worship of the one God of the universe. Christians would take a holiday like Saturnalia and reclaim it to celebrate the birth of Jesus, the Light of the world. In later centuries, Patrick would recast the traditions of the Irish people in order to teach and remind people of the truth of Jesus. The book on Valentine is very good and I recommend it for use by parents, pastors, and Sunday School teachers who work with young people. Lent is a time for spiritual renewal, which always begins with repentance. To repent means, quite simply, to turn away from sin--whether deliberate rebellion against God or the accumulation of small, otherwise innocent habits which, taken together, crowd God out of our lives--and to turn to Christ for forgiveness and life. My colleague, Glen VanderKloot, sent a link to this post from the How To web site which lists some spiritual disciplines you might want to take up to live repentantly during Lent. Of course, repentance is to be a daily feature of the Christian's life and the season of Lent itself is a human-made custom. But its forty days are an intense reminder of the importance of constantly turning our lives back to Christ, lest sin take hold of us and find us, with scarcely any awareness on our parts, far from the Savior Who gives us life. To me, it's just as important for us to adopt new habits that draw us closer to Christ as to drop old ones that take us away from Him. That's why I like the link shared by Glen. Check out the list. You may want to pick one or two for yourself this Lent. But don't be surprised if you're still doing them after Lent. "If you know the truth, you can discern what’s false." Intrigued by that passage, I once asked a Hebrew scholar about it. He confirmed my suspicions: The pleasure to which Sarah referred wasn’t just the pleasure of having a child. She was also talking about the pleasure of being sexually united with her husband. God made us sexual beings, in part, so that husbands and wives might enjoy an exclusive, lifetime covenant sealed by sexual intimacy. I think the video is self-explanatory. But I should point out there may be some slight inaccuracies. One I know I made was when, some time later in the presentation I referred to the Germans as "the Lutherans." I think that you'll pick up on it. NOTE: Abraham believed and God counted his belief as "righteousness" in Genesis 15:6, and not in Genesis 12, as I erroneously say in the video. One of my favorite preachers, Gerald Mann, tells a joke about a televangelist who went skiing. He had never been skiing before, but he was full of himself and, stupidly, simply strapped on some skis, climbed onto a ski lift, and headed up a mountain. He passed the green and blue stations, spots where inexperienced and intermediate skiers, respectively, were to have gotten off the lift. Instead, he rode all the way up to the black station, confident that despite his inexperience, he would do well. When he reached the top of the mountain, he jumped off the chair and down the hill he went, end over end through the first turn. He flew over a cliff into a gorge. Interestingly, there is a disembodied voice in our Gospel lesson today. It comes from a cloud that has descended to a mountain. And this voice, which we can take to be God the Father, tells us that God is more than a disembodied voice. We all would like to trust that. But can we? And if so, how? Throughout this Epiphany season, which began on January 6, we’ve said that the Gospel lessons on these Sundays have all presented epiphanies, manifestations of Who Jesus is and what He can be for us when, by faith, we let Him be. In Epiphany, our picture of Jesus has been unscrambled and we have seen that He is more than a man, more than a great moral teacher, more even than King of the Jews or Savior of the world. The three disciples who Jesus took with Him to the top of the mountain in our Gospel lesson probably had no clear idea of why they had followed Jesus in the first place or why they were now on this mountain with Him. These words of Jesus would not have computed in the minds of the twelve apostles. The Messiah to suffer in the holy city of Jerusalem? The Messiah rejected by the very religious leaders who should have hailed him as king? The Messiah killed? Those thoughts would have been so mind-numbingly confusing to them that they would hardly have taken notice of the most incredible claim of all, that after being murdered, the Messiah would rise again. But on this Saint Valentine’s Day, it’s important to remember that love is more than words, especially the love God has for us. And so, God gives the three disciples closest to Jesus more than words. He will show them how the Messiah can be both God of all and servant of all, crucified like a criminal yet the King Who brings life. 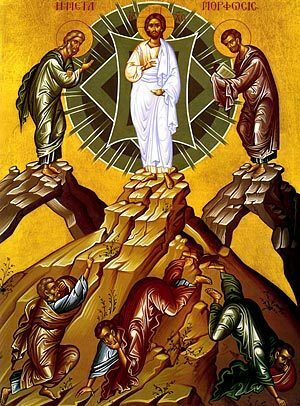 At the Transfiguration, in the presence of Peter, James, and John, 1300 years after Moses had encountered God on Sinai, Jesus was soon joined by Moses, who had died about 1240BC, and Elijah, whom God had taken to heaven in about 840BC. They discussed Jesus’ departure—literally Jesus’ exodus*—His impending death and resurrection. Thinking that he could bottle up the glory of this moment, Peter suggests that three booths should be built, one each for Moses, Elijah, and Jesus. God is more than a disembodied voice. God is embodied in carpenter from Nazareth Who, sinless, willingly sacrificed Himself on a cross so that all who disavow their sin and entrust their lives to Him, receive the power to live this life whatever the circumstances and a new life that goes beyond the grave in an eternal kingdom with God. And what will we hear when we listen to Jesus’ life, teaching, death, and resurrection? We will hear, first of all, that God loves us and seeks relationship with us. In one of Jesus’ most famous parables, He tells the story of a father who leaves all dignity behind in order to run to a son who had become lost in sin. He kisses his boy, puts new clothes on him, and rings on his fingers and throws a party. Just so, Jesus says, God throws a party in heaven every time one of us realizes our sin and our need of God and turn to Him for forgiveness and life. When we listen to Jesus we also hear that God’s expectations of us as human beings has not changed. God still hates the sin while loving the sinner. Jesus affirms that to build our lives on anyone or anything other than God is sin. Neither our families nor our countries, neither material acquisitions nor influence are strong enough foundations to sustain our lives; only the God we know in Jesus Christ is! You know, I wish that we had the same attitude and understanding of God's commands, as succinctly stated in the Ten Commandments, that the ancient Jews had. We have the same feeling toward God's law as we're likely to have toward the skunk who crashes the party. We think they mean God is a spoilsport. But the ancient Israelites understood that God's commands are gifts. "Within the parameters of this commands," God says, "there is life and happiness and relationship. Transgress them and you walk away from relationships with others, with your true selves, and from Me." Jesus said that He came into the world not to overthrow the law, but to fulfill it. ** But God's laws still function as a mirror for us all, showing us our need of God and, as was true of the son in Jesus' parable, to run go back to the Lord Who runs to His children. But we also hear this when we pay attention to Jesus: We can be forgiven. We can be made new. True story: He had been going his own way for a long time. He had joined a small startup company with a newly minted Masters of Business Administration degree and, as the business had grown, so had his prosperity and prestige. He had become a big shot and he knew it. Later, he revealed that there had been some fudging along the way, little deals that might have gotten him in trouble were it not for the fact that he counted prosecuting attorneys, police chiefs, and even a state attorney general among his friends. But it was all good, he told himself if ever he had second thoughts about his ethics. He had everything he wanted: the nice house, the new cars, the sumptuous vacations, the beautiful wife, the 2.1 perfectly coifed and orthodontistized children. All went well. Then near-tragedy struck. A twin brother to whom he was close nearly died. He watched his brother’s family through the long months of hospitalization and realized that, in spite of their lower middle class lifestyles, they had something he didn’t have. They didn’t have the answers. They didn’t have an unimpeachable promise of a trouble-free life. But they had a lifeline to the God of the nail-scarred hands. They had Jesus Christ. And even though he knew it meant dying to the power of all of the things for which he had lived and striven all his life, this man grabbed hold of Jesus. Today, he and his wife strive to ensure that in everything they do, they strive to honor God. Being a Christian isn’t about being perfect. (If you want confirmation of that, look at me. At the top of my blog, in my personal profile space, I say that, "I am an imperfect sinner." A few weeks ago, a guy wrote to me and said, "Mark, I bet if you worked at you could be a perfect sinner.") Being a Christian isn't about being perfect. It’s about listening to Jesus. It’s about hearing that God wants nothing more than having a relationship with Him. It’s about dying to sin and making what God wants for us more important than what we want for us. It means knowing that even when we fail to love God and love others as we love ourselves, we can be forgiven. *The exodus, recounted in the Old Testament book that bears that name, is the central event of Israel's history: God's miraculous deliverance of ancient Israel from slavery in Egypt. Jesus' death and resurrection play a similar role in the New Testament. It is through Jesus' crucifixion and resurrection that He is able to lead all who follow Him out of slavery to sin and death. Whereas, the Old Testament exodus is foreshadowing, through His chosen people, of "coming attractions," Jesus' exodus is of cosmic significance. Jesus' exodus has brought the inevitable establishment of a new heaven and a new earth which His followers only experience dimly at best today, but will come in fullness when Jesus returns at the end of history. **Jesus also says that He came to fulfill the word given by the prophets, an interesting and important point when considering that the two ancient Hebrews who met Him on the mount of Transfiguration were Moses, the one to whom God first gave the moral law, and Elijah, the greatest of the ancient prophets. The Bible, God's Word, encourages husbands and wives to enjoy sexual intimacy when the opportunity presents itself. A great Valentine's Day read for wives and husbands might be the Old Testament book, Song of Solomon. Among other things, it celebrates sexual intimacy as an opportunity for couples to generously bring pleasure and the assurance of undying commitment to one another. The New Testament book of Ephesians makes clear that the relationship of wife and husband is to be one of mutual, voluntary servanthood and consideration. This includes the sexual component of the marital relationship.